The United States is China’s biggest foreign supplier of the goods. Now come the tariffs. 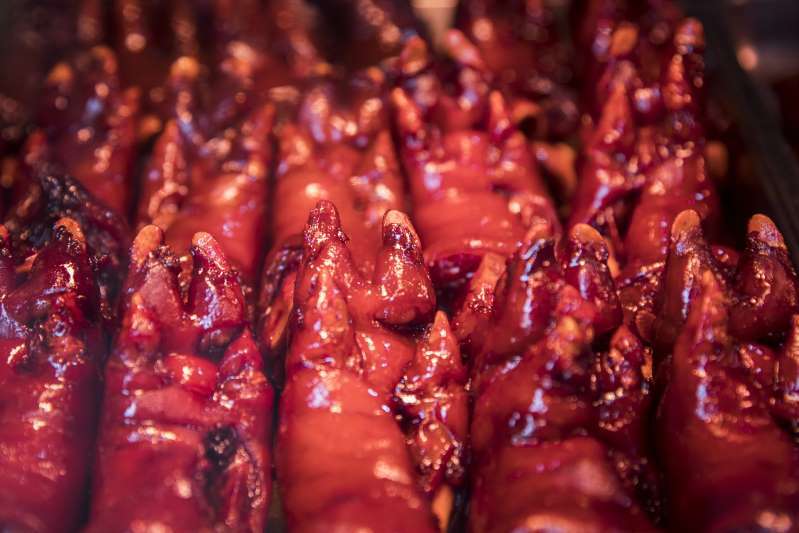 Glazed pork, a local delicacy, is offered at a shop in Zhujiajiao, China, a popular tourist destination on the outskirts of Shanghai, on July 31.
he cost of pig feet was climbing, and Xu Min wondered: Had the trade war reached her market stall? The 29-year-old mother of two sells every part of the hog in a town known for braised hoofs, a classic snack here called trotters. She carves the meat for local vendors, who slather the feet in soy sauce and hawk them along a nearby canal for as little as 15 yuan, or about $2. Geopolitical sparring does not come up often at this market of fresh cuts, watermelon crates and crabs wriggling in plastic bags, Xu said, but lately she and other merchants have swapped grim predictions about the commercial fight between the United States and China. The first signs of trouble from President Trump’s tariffs on $34 billion in Chinese goods — and Beijing’s retaliatory levies on an equal amount of U.S. imports, including pork and soybeans — are just emerging in both countries, where some workers are bracing for economic turmoil. Foreign swine that arrives frozen in Shanghai and other port cities is crucial to Xu’s business, she said, even though she purchases pork from local farmers. The imports roll in on refrigerated trucks to warehouses across China, bolstering the national supply, she said, and helping to keep her costs low. “Things are getting more expensive,” she said, noting that her supplier had asked for a few extra yuan over the past two weeks. The latest round of 25 percent duties, which took effect in early July, is expected to shrink U.S. exports to China, the fourth-biggest buyer of American swine and the world’s largest pork consumer. China bought 309,000 tons of pork last year from farmers throughout the Midwest and the South, and a lot of the shipments carried parts that many Americans don’t normally eat: heads, tails, guts and feet. The deal is a boon for American producers. Chinese buyers pay a premium for the hoofs, which are considered a delicacy and even a beauty booster — collagen in the fatty flesh is supposed to help make skin glow. But the new tariffs could severely jeopardize this Sino-American arrangement, landing on top of another 25 percent duty China imposed on American pork in April in response to levies that Trump placed on Chinese steel and aluminum. Already, the U.S. loads of pork variety meats to China have diminished, according to the most recent export data, from 12,354 tons in March to 11,095 tons in April to 9,071 in May. The damage is harder to measure in China, where the official line is: We can handily replace these outside goods with homegrown livestock. Industry observers, though, say the country should protect its trade alliances to meet the growing demand from the exploding middle class. The cost of pork overall in China has increased 10 percent since May, according to the Agriculture Ministry, which does not release corresponding price data on variety meats. However, the price of pig heads, tails and feet in the eastern province of Shandong jumped 7 percent from May to late July, said Barney Wu, an analyst at Guotai Junan Securities in Shanghai. Even Rogers Pay, an agriculture analyst at a Beijing consulting firm called China Policy, said the swelling price of soybeans, another tariff-affected commodity, could also increase expenses for sellers. “Most of that soy is for pig feed,” she said. On the trade warpath, Trump has shown no sign of backing down, threatening in July to impose duties on an extra $200 billion in Chinese products. The president has said he aims to close the United States’ $376 billion trade deficit with China and pressure the Asian nation to scrap policies that force U.S. firms to divulge their proprietary secrets if they want to enter the Chinese market. This escalation has startled vendors such as Xu, who wants the spat to be resolved. Pig feet, tails and ribs support her 5-year-old daughter and 7-year-old son. Pork allows her to pay their monthly rent of 500 yuan, or about $75. One aisle over, another butcher said he was happy to absorb a loss for the good of his country. Gao Jun Gui, 56, has sold pig feet to local stands here for five years. His supplier lifted prices by 2 percent in July, he said, and he suspects the tariffs have something to do with it. This could be an opportunity for China to reduce its reliance on outsiders, he added. Across town, one of the market’s regular customers brushed sweet, reddish sauce on her domestically produced trotters and displayed them on steel trays in a shop window. Wu Lin, a 45-year-old stall owner in clear jelly sandals, doesn’t think the U.S. tussle with China could jeopardize a treat this juicy. Tourists from Asia, Africa, South America — “everywhere,” she said — come to try it. But in Qibao, south of Shanghai, another pork foot dealer in a Hello Kitty apron said the food company she partners with recently made a significant change: Six days before Trump’s first tariffs were scheduled to begin, the business stopped sending her imports. She doesn’t know what that means for the future of her business, the Most Nostalgic Shop.